I noticed you before you noticed me. I saw you sitting on the bench as my husband pulled up to park. Your matted gray hair, the hunch in your back, and the way your head rolled in small circles reminded me of someone from a recent past. You walked towards me, my husband, and my sons. I saw your first step before they did. I could hear you even though they couldn’t. I will be back. I heard you. I saw you. And I want to help you. I don’t know who your daughters are, or where they are, but I heard you. I am sorry to hear that that officers hurt you, and that you are hurting. No, I don’t think that’s okay. I know you need more than a roof over your head. I know it isn’t easy to hear the “real you” sometimes, and it’s lonely when you can. Dear Sebastian, I will be back. Thank you for noticing me too. I recently had the honor of flying out to DC for the Rare Under 40 Awards Ceremony. The trip felt like a whirlwind, but I came back home feeling energized and uplifted from meeting so many inspiring souls. I have to admit I felt a little out of my element. I never thought I’d go from sidewalks to a red carpet because of this blog, my photographs, and from simply opening myself to others. I wished it could have been Hobo Bob, Darryl, Brian, Nani, or Roxy on the red carpet instead. The story of my journey with my father may have captured hearts and souls around the world, but it’s the stories of those who I’ve met along the way that continues to weigh on my heart. There are endless waves of Brian’s, Nani’s, Roxy’s… all lined up alongside fences and scattered throughout parks. So many hearts hungry for love. We are all hungry for love… validation of our worth, our dreams, and our hopes. It’s easy to doubt ourselves, to shut people out to protect our hearts, to grow hardened from years of living in fear and uncertainty. The world is full of pain and suffering, but the smallest gesture of kindness can be the spark we/you/I need to preserve the softness in our hearts for others. I was reminded of that during my trip to DC. And it goes further… we long for friendship, and to have our hearts be seen. I’ve been reflecting on my past and continuing the journey of self-discovery. I know that in my heart of hearts, I have yearned for deeply connected friendships. Out of fear of being hurt or misunderstood, I know I have pushed people away and opted to stay in my own comfort zone. I would maintain a busy schedule, pour myself into projects, my family, and sometimes use that as an excuse for not investing in people who were trying to invest their hearts in me. It’s an interesting feeling having so much of my life and my heart written out for others to see. I’m learning to embrace it because it helps me to live a life closer to my purpose. I’m not as afraid of people coming to me, opening themselves in hopes of having a shared connection. It has been an incredibly enriching experience, and I appreciate how much love I’m able to receive because of it. There’s still a lot to work on… on a personal level. There are still loved ones in my life who I want and need to reach out to. Someday. Another honest response… I shared how I wake up every morning with the understanding and acceptance that I will die. My eyes will close and never open again to see this world the way I do today. Knowing and accepting this gives me the strength and serenity to go after my dreams, to follow my heart everyday… to stay open to soul connections with people no matter their circumstances. 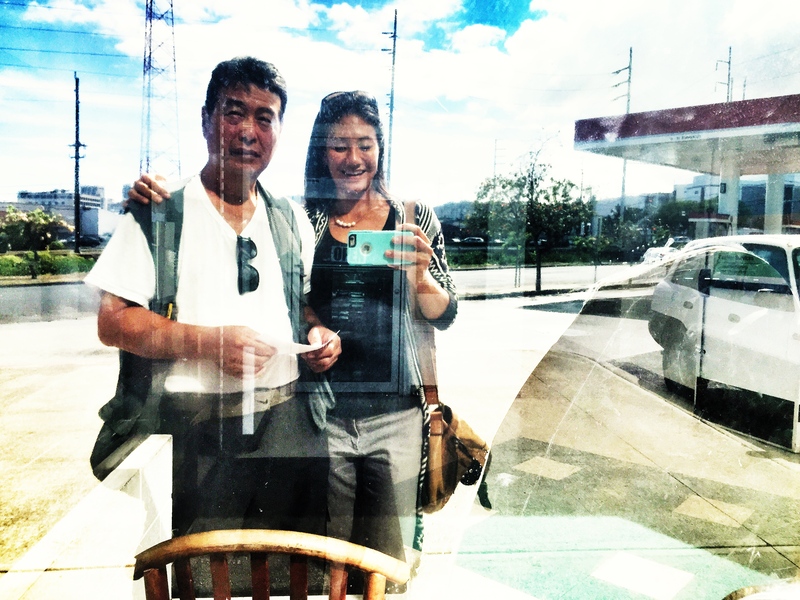 As I finish writing this blog post, I’m looking into my father’s eyes reflecting back into mine. Across the way is a homeless man who is suffering from mental illness, he just came by about 5 minutes ago and asked us for food. 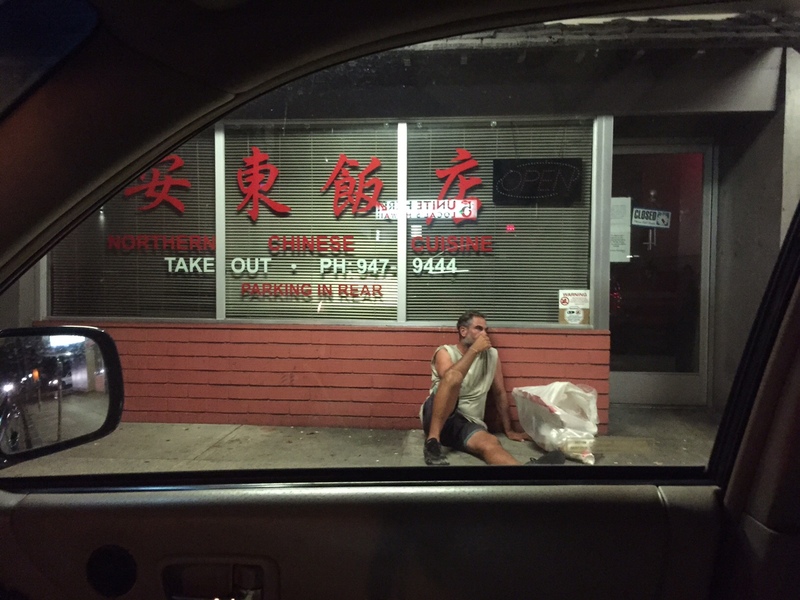 I don’t know his name, or his past… I don’t know what he is battling, or what kind of pain he is feeling right now. But I hope to find out soon. Yes. Me too. Now it’s time to keep moving forward, and paying-it-forward. I’m sighing deeply this very second. Wishing all the best to you this beautiful day. 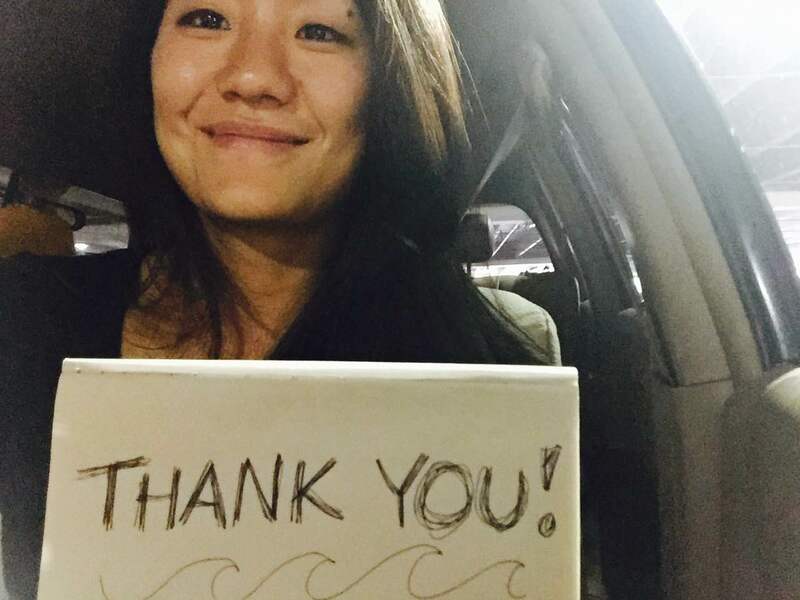 Thanks for following along and I hope it encourages you to share one act of kindness today. 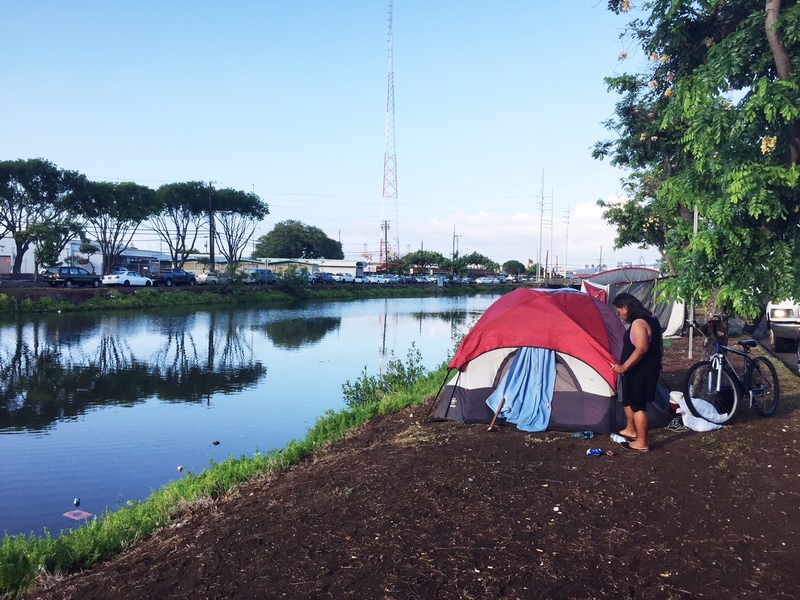 A couple of weeks ago, I wrote about my encounters with some of the children in Kaka’ako and the frustration of not being able to help. A lot has happened since then. It seems like my universe has been throwing words and signs of caution as I continue to visit Kaka’ako. For a variety of reasons, my friends and family have shared their concerns for my safety. I understand. The most recent news of a Hawai`i legislator being a “victim of ‘gang-style’ attack” is reason to be concerned — I get that. But I feel an incredible tug to visit the kids I have gotten to know in the area. 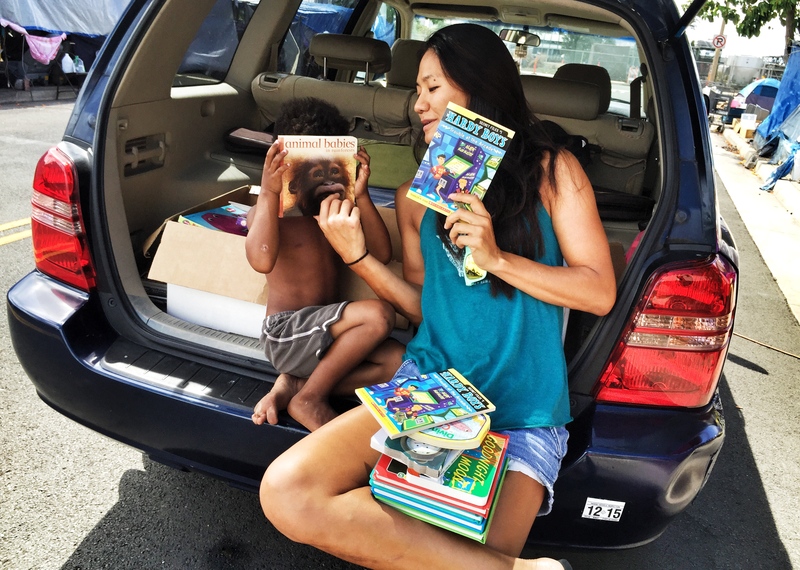 I drove through Kaka’ako this morning with my trunk full of books, donated by a friend from Read Aloud America. Instead of parking in my usual spot, I decided to drive into the back area so I could unload the books closer to their tents. A couple of kids recognized me, so I decided to pull over onto the side of the road. As I passed out the books, I noticed a little boy I hadn’t seen before. He had a slender frame, dark tanned skin, and beautiful little eyes that sparkled with curiosity. I asked if he would like to have some books to read, and he immediately crawled up into the back of my SUV and started to dig through the pile. I smiled. After the older kids had walked off, it was just my new little friend and I sitting in the back of my SUV. I learned that he was 4 years-old, loved to eat candy, knew his ABCs, and wanted to go to school. Our conversation was interrupted when a tent close-by erupted with shouting. I looked over towards the tent and saw a woman yelling at a younger girl. I asked my little friend if he knew who they were. I felt for his sister. She slouched into her chair, trying hard to keep her tears in, trying desperately not to fight back even with her mother yelling, spitting, and pushing her around. My heart sank. I could see at this point that the argument and fighting was escalating fast so I decided to take the boy towards another tent where his friends were. As I ushered him towards another tent, a law enforcement vehicle drove straight towards the mother and daughter. I let go of the little boy’s hand and walked towards my car and the officer who had stepped out. The mother and daughter who had been fighting simmered down really fast, and then I realized I was in trouble. I approached the officer and his first question was: Is this your car? I answered… Yes, yes it is. I’m just here to pass out books to the kids. The conversation that followed happened so fast. I wasn’t supposed to be parked on that street. I understood this. And at the same time I had a good reason for it… I couldn’t carry three boxes of books by myself, and thought parking on the side of the street would be fine. I wasn’t going to fight him. If I’m wrong, then I’m wrong… even if I had good intentions. He asked for my license and registration. 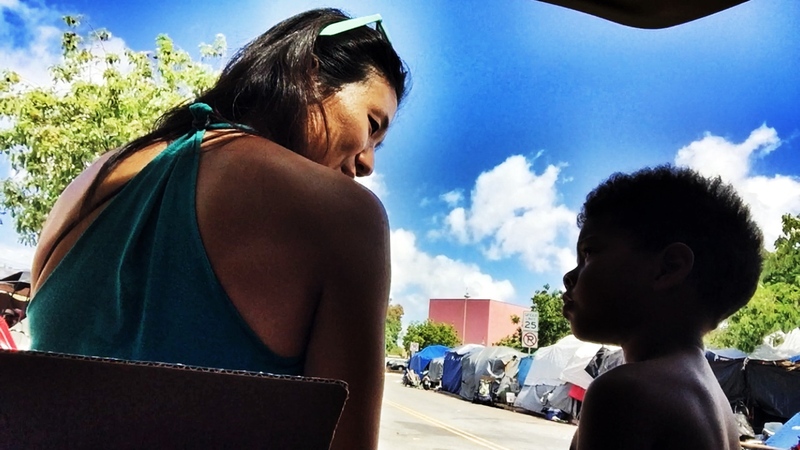 As I reached into the car to get my documentation, I kept thinking to myself, “I can’t believe you’re getting in trouble for trying to help these kids… it’s okay… it’s fine…” From the corner of my eye, I could see the mother and daughter sitting quietly in their tent and the little boy standing outside. How ironic. I shook my head at the circumstances, took a deep breath, and faced the officer with my documentation. He told me that my parking there was only contributing more to the chaos and lawlessness of this area. I understood where he was coming from. I wasn’t upset or angry with him. He was doing his job and having to do these rounds everyday. I’m not even sure what I meant by that when I said it to the officer. I just wanted him to know that I was there because of something deeper inside of me. A life experience that was far more meaningful and thoughtful than a parking mishap. I looked into his eyes and stood there quietly for a second. And then I apologized again. This kid over there has no good role models from what I can see. I’ve been spending the past half an hour reading to him and getting him excited about learning to form words. Then the officer said, “Do you realize how dangerous this place can be?” He went on to explain how assaults and rapes are a growing concern in the area. I acknowledged his concerns. In some quiet way, my universe is gently asking me to be more mindful and careful with how I spend my time in the area. I recognize that there are risks to everything in life. I know that what I’m doing by approaching individuals with substance abuse and mental illness means that I take on a certain level of risk. At the same time I know that I have to trust my instincts and I don’t want to stop approaching them. If anything, I have plans to bridge my legal studies with my homeless outreach through existing organizations in our community so that I am safer. And yet I know that the “real help” and opportunities for growth happen when I’m out there as an individual, just somebody who cares and wants others to know that I do. These kids are especially hungry for love and attention. They are bored. They are beaten. They witness everything that we see in the news. And yet they are so tenderhearted. I want to help them somehow. I have ideas and am looking forward to forming them. For now, my heart goes out to the children there. They need more than just books, toys, used clothing, and food. They need love, consistency, stability, role models, stable parents, a home that provides them the security to branch out and discover themselves and the world. I want so much more for them. I think we can figure this out together. 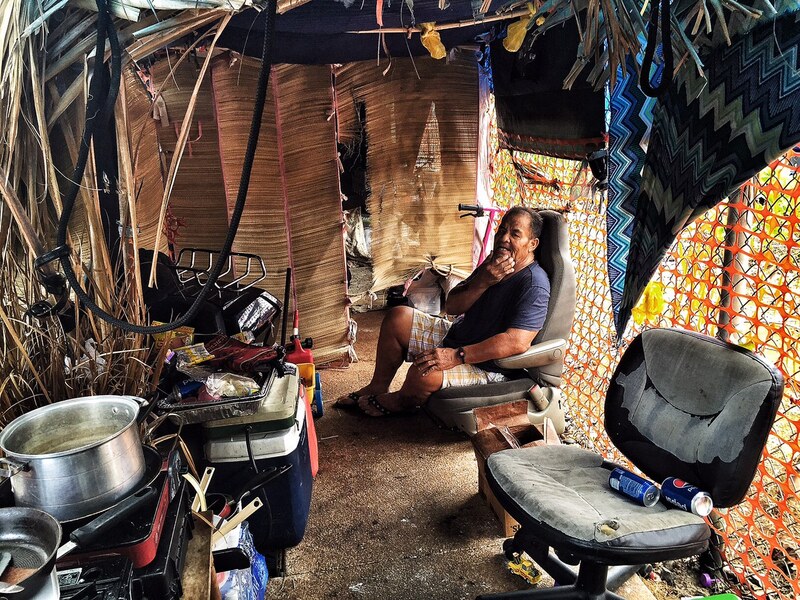 Sam resting in a friend’s makeshift shelter in Kaka’ako. Some days my Creator/God/Universe seems to speak louder than others. Today has been one of those days. I finished my last law school examination for the semester this morning. I knew exactly where I wanted to be. Kaka’ako. 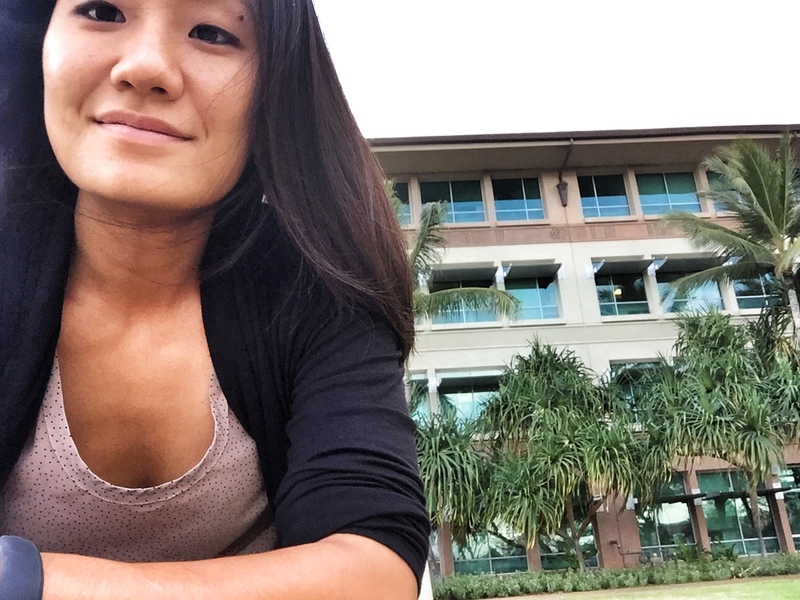 Just last week, I was in Kaka’ako for a Spring Symposium on Homelessness and Policy Change, hosted by the John A. Burns School of Medicine’s Partnership for Social Justice. I was invited to speak and share my candid experiences on trying to assist my father, and the project that I have been working on. It is such a peculiar feeling driving up to a location and passing rows and rows of tents filled with children and families without homes, and then parking in front of them to walk over to an auditorium so I can speak about their social condition. It was a privilege to be able to share our story, their story. At the same time, I knew I had to drive away that night and I wouldn’t be able to reach out to anyone. So, I’m glad that I was able to spend some time getting to know the families in Kaka’ako again. Capturing the quiet moment before the JABSOM Spring Symposium on Homelessness and Policy Change. Nani has been sober for a number of years and is currently “in transition,” as she applies for jobs and continues her education/training for better employment opportunities. She is the “Aunty of Kaka’ako” from what I gathered. Humble, focused, caring, and somewhat of a watchdog for the kids in the area. With three children of her own, she prioritizes their education and makes damn sure that the other kids go to school, too. But she also recognizes that she can’t be a parent to all of them, and at some point, the parents need to step up and take responsibility. Nani and her close friend looking contemplating the best word to describe their portrait in the polaroid. 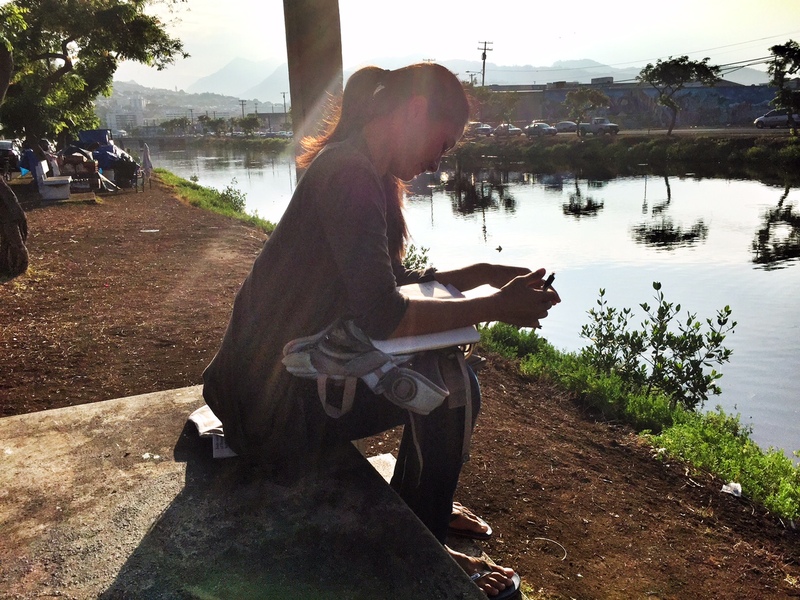 Life is about making things “pono.” I completely agree with her philosophy and approach in life. Nani’s focus and determination is infectious… even to me. 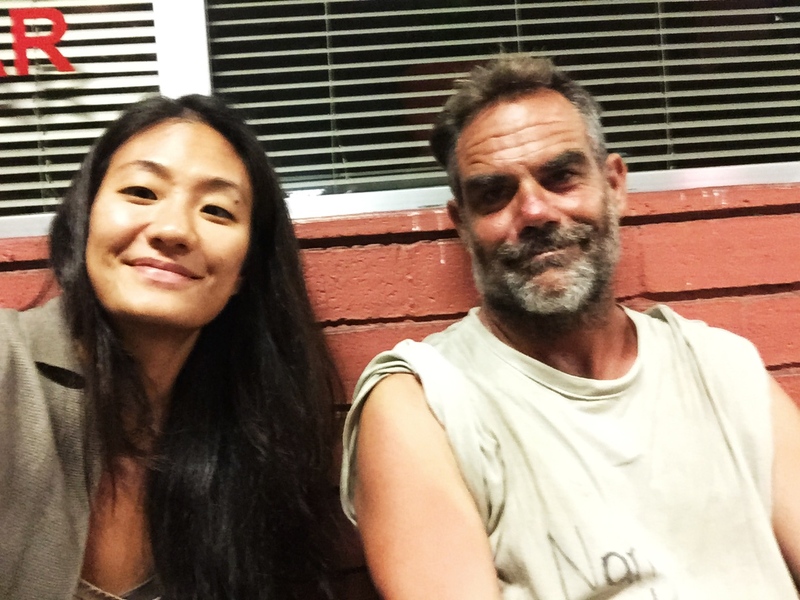 She is a great example of someone who is on the streets due to economic circumstances, and intends to get a better paying job so that she can have a better living situation. 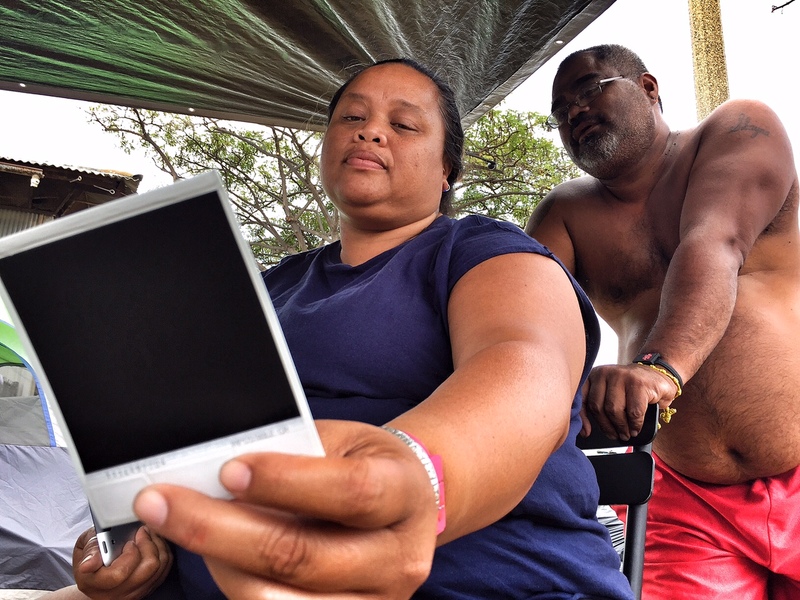 In her own words, she said that Kaka’ako is a village. People do help each other out, try to maintain respect and civility, but things can get out of line just like anywhere else. She tries really hard to “keep the peace” and help the children and teenagers, so they don’t run astray. I admire her. And I know I will be seeing more of her when I go back later this week. As I drove back home, I thought about the interconnectedness of life again. This continuous theme of cause and effect — the people in my life and how our paths cross in ways that magnifies/crystallizes the experience of living. Maybe it’s because I seek it out. Call it an encampment, an eye-sore, a public nuisance, a village, or whatever you want… but, I know that Aunty Nani sees it as family. They’re all families trying to survive. Amazingly, I checked my inbox right before I started writing this post and received an e-mail from an ongoing supporter of my Kickstarter project. Over the past few months we exchanged a number of e-mails and he shared a bit of his own personal story and dedication for social change. 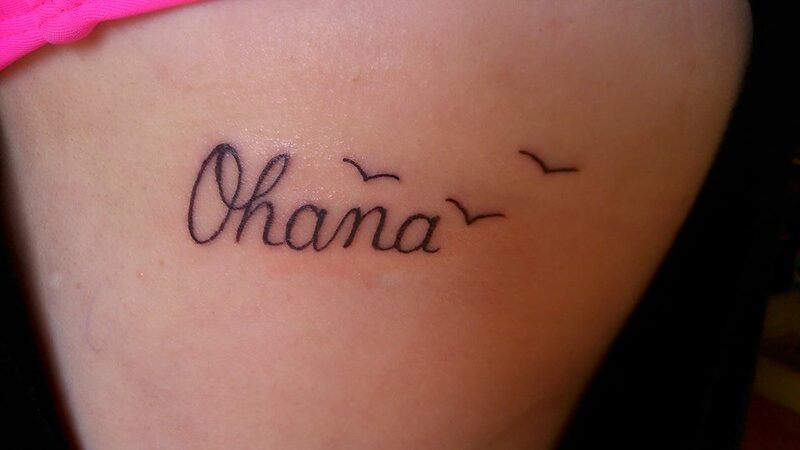 I was touched when he shared that one of his daughters wanted to get a tattoo of the Hawaiian word for family (‘ohana) as a way to remember her ailing grandfather, who has since passed away. It turns out that three of his six daughters decided to get the same tattoo to honor him by. Again… the interconnectedness and theme of family is so strong here. In the e-mail, he mentioned the part about “Lilo explaining to Stitch that ‘ohana means family and although theirs may be tiny and broken, it is still good.” This resonates with me for a number of reasons. First, because I felt the same way as a child. Second, because that quote was referenced during my Kickstarter campaign when ‘Ohana Health Plan helped to support my project. Life is so intriguing when you look for the connections and today’s experiences continue to reaffirm my path. With the permission from my friend from Canada, here is a photograph of the tattoo that three of his daughters got together in honor of their late grandfather. Thanks for reading… Looking forward to sharing more as I continue the journey. I’m in the middle of finals week at law school, but I wanted to take a break to share what has been going on in our world. As the legislative session comes to an end, I am reminded of how public policy shapes and impacts our everyday lives. I had a conversation with my dad a couple of weeks ago about the “criminalization of homelessness,” and I have to say that I agree with his position on this issue. Rarely do we hear from the individuals who directly experienced homelessness and suffered from mental illness. I am so proud of him and his ability to articulate how these laws impact the homeless. The homeless are human. It is so important not to forget that. I was at Costco this past weekend and ran into my former landlords. They ran up to my husband and I, smiling and waving at us with their two daughters. It was great to see them and I was surprised when they brought up the photo essay that was published last month. 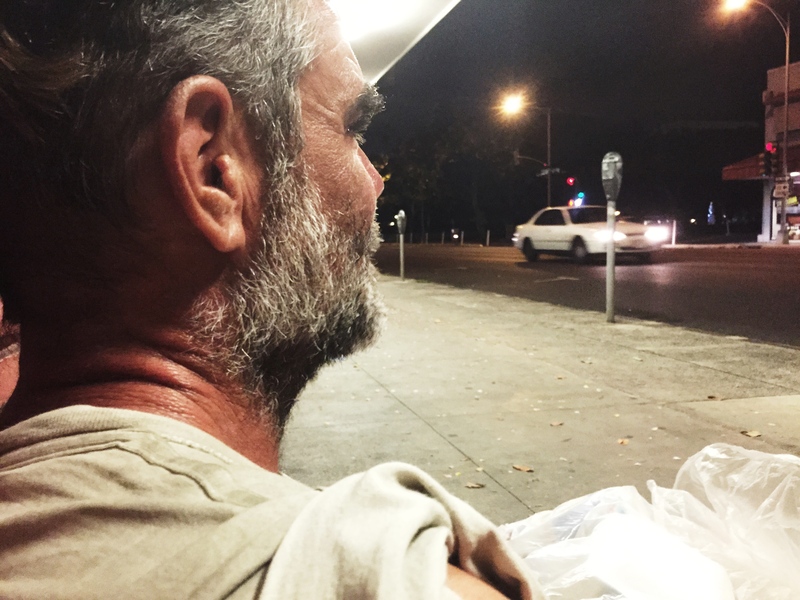 The wife shared how her view of the homeless changed because of what she read and the dramatic changes she saw in my dad after he was able to get treatment. God, I live to hear that… truly. It made me teary-eyed hearing her reaction. It’s this kind of support and feedback that reaffirms my path in reaching out to the homeless. And I am even more grateful for the fact that my dad is still doing well today. 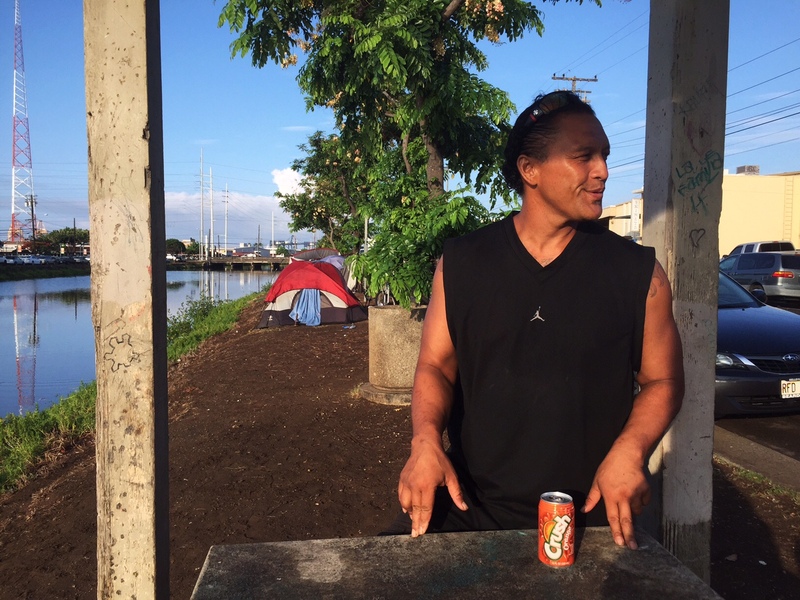 I’ve been keeping a record of all the people who have e-mailed and shared their own stories of loved ones on the streets/forests/beaches of Hawai`i and am looking forward to finding them. I do believe that in every person is a soul and being that deserves respect. They may not have made the best decisions in life, or even be in a physical/mental position to make good decisions… but, they are human. Thank you to everyone for continuing to follow the journey. See you after Finals Week!